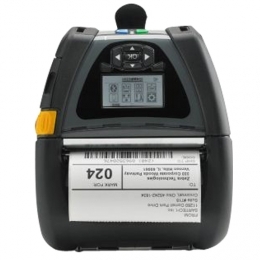 Mobility provides speed - and the mobile label printer QLn420 from Zebra is no exception. It offers direct thermal printing for media up to 112 mm wide. Utilize the QLn420 in both incoming and outgoing goods, for inventory, commissioning and packaging of goods. When it comes to robustness, the QLn420 follows the proven path its rubber coating and seamless design ensure that it withstands drops from heights of more than 1.8 m without any negative effects. Integrate the QLn420 easily into any environment, thanks to its key features backwards compatibility, ZPL support, including 802.11 a/b/g/n and Bluetooth combined dual radio. With the optional charging and docking station you also have remote access for convenient remote management of all printers. USB and RS232 interfaces complete your connection possibilities. The QLn printers are MFi-certified made for iPod/iPhone/iPad and also support Android and Windows devices, thanks to their multi-platform SDK apps. Users also profit from the practical help menu, quick printing with up to 102 mm per second, and low energy consumption.